On An Overgrown Path: Classical music debates - but will anything change? 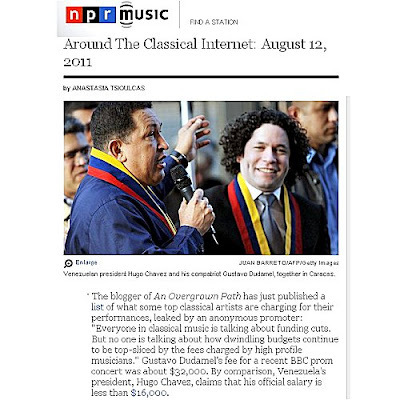 Classical music debates - but will anything change? National Public Radio in the States is among the media channels that picked up on my story about musicians' fees. The widespread interest confirms that the subject of fees has been off limits for far too long. Or, as a journalist said to me, "If a secret is closely guarded, it's usually because something somewhere is wrong." Musicians' fees certainly makes compelling headlines. But, as I said in my original article, we must beware of jumping to conclusions. Despite the attention now focussed on fees, one group within the increasingly fragile classical music business model continues to evade scrutiny. There is no doubt that agents provide a valuable service by matching performers to opportunities. But my article highlighted the not inconsiderable portion of dwindling budgets that is paid to agents. And other aspects of their role remain almost completely hidden. One is the limitation of choice resulting from the selling of 'packages' of conductor, soloist and orchestra, all from the same management, to concert promoters. Another is the predatory move by agencies into the management of music festivals. Forget about human rights, China is where Lamborghini sales are booming and classical music has not been slow to spot this. A few days ago I highlighted the move of outgoing BBC Symphony Orchestra chief conductor Jiří Bělohlávek's from IMG Artists to the Hong Kong and Shanghai based Armstrong Arts management agency. Among the services offered by Armstrong Arts is "consultancy": this includes an unspecified role in the Shanghai Symphony Orchestra's new summer music festival. According to the Xinhua-Dow Jones index, Shanghai is the sixth largest financial center in the world. In the city Armstrong Arts share their territory with super-agent Columbia Artists Management, which represents both the Shanghai Symphony and its music director Long Yu. The latter has been described by the New York Times as "China’s Herbert von Karajan" and, following a familiar pattern, includes Deutsche Grammophon among his recording contracts. Shanghai may be a leading financial centre, but the insidious power of the agents has been around a lot longer than bankers' bonuses. Back in 1955 the United States Department of Justice filed suit against Columbia Artists Management and three other defendants for restraint of interstate trade and commerce in the booking of artists. The agencies did not defend the case and were forced to relinquish their monopoly position. As I said in an earlier post, while classical music debates nothing changes. So no triumphalism; just some hope that one day we will see greater equality of opportunity and reward for classical musicians. The choice of header image is NPR's not mine; more on that subject in A tale of two Chavez. Re the tentacles of the management agencies, there is at least one that has succeeded in wrapping itself around a whopping amount of recorded music. ICA (International Classical Artists Management) Classics is in charge of the BBC Legends series, as well as the archives of Cologne WDR and the Boston Symphony. The DVDs Art of Piano, Art of Violin and Art of Conducting issued from ICA. And then, of course, they issue concert performances by artists on their own roster. Knowing this helped explain to me certain oddities in the Art of...DVD issues, for a start. Thanks Philip. Other "tentacles" are worth exploring, particularly those spread by the BBC New Generation Artists Scheme which is an opaque hybrid of concert/broadcast promotion, quasi management arrangement, BBC Radio 3 sub-brand and rcording deal. "As part of the scheme Radio 3 has also collaborated with record companies, including nine co-production CDs with EMI Debut series, three of which (Belcea Quartet, Simon Trpceski and Jonathan Lemalu) have won Gramophone Awards for the best Debut CD of the year. There have also been co-productions with Harmonia Mundi, Decca, BIS, Sony Classical and Basho, while a number of New Generation Artists have also featured on BBC Music Magazine cover CDs."